The launch trailers for many consoles in retrospect look more than a little bit silly. The Nintendo Switch reveal trailer especially is all kinds of aspirational cringe worthy material, with its cool young folk living their bohemian lifestyle of have homes that aren’t filled with crap and playing multiplayer games on rooftops. One reveal element that really took everyone by surprise was the potential for multiplayer on the Switch with each player using a single Joy-Con. It was and still is a novel idea, as such you’d expect the console to be positively dripping in co-op experiences but oddly the store is more filled with mobile ports and just not very good games. 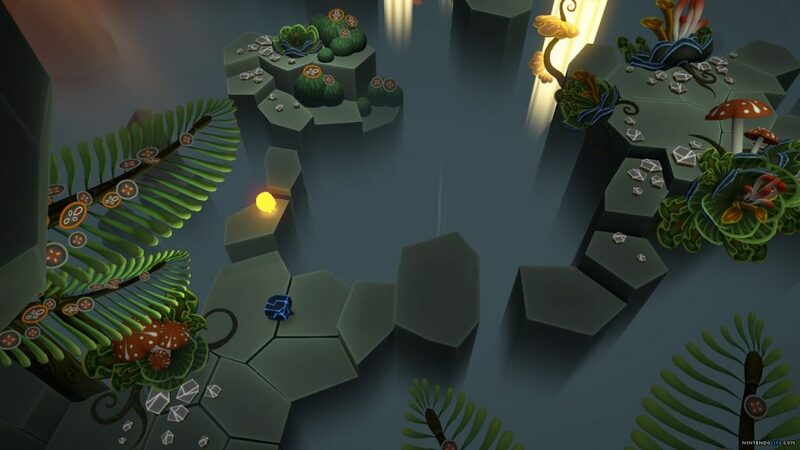 Thankfully Pode has stepped up to throw its hat into the co-op Switch ring. 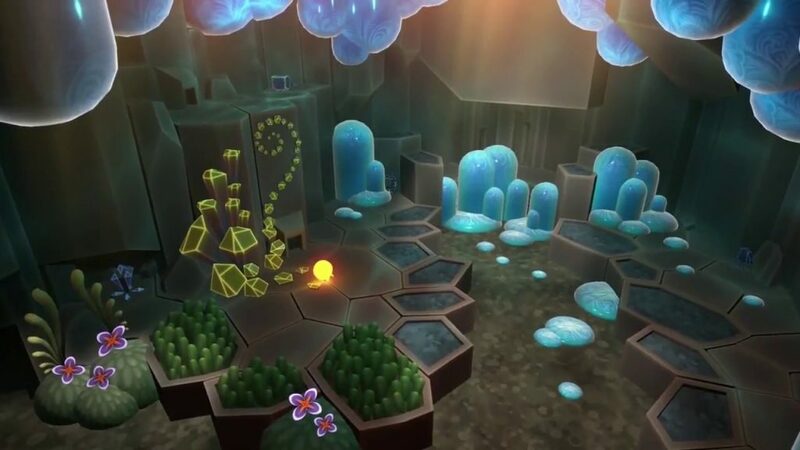 The game sees each player taking on the role of a small elemental, one based around rock and the other based around light. 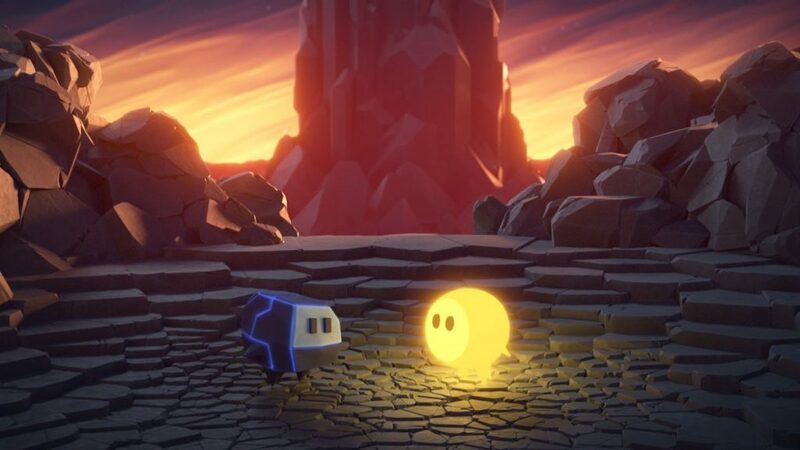 With these incredibly cute and adorably designed avatars you must both navigate cave systems with the simple goal of Bulder, the rock, helping Glo, the fallen star, back home. Each character has its own contrasting traits and abilities. Bulder can eat rocks (and Glo) and change its mass to squeeze through tunnels and push buttons. Glo produces light wherever they go, this has the ability to spawn plant life in these dank and barren cave systems, occasionally the plant life spawns giant leaves allowing themselves to be used as platforms. With these basic mechanics in mind you are tasked with dozens of levels of quite clever puzzles that will on many occasions have you sitting and staring at your screen until divine inspiration strikes and you can progress. 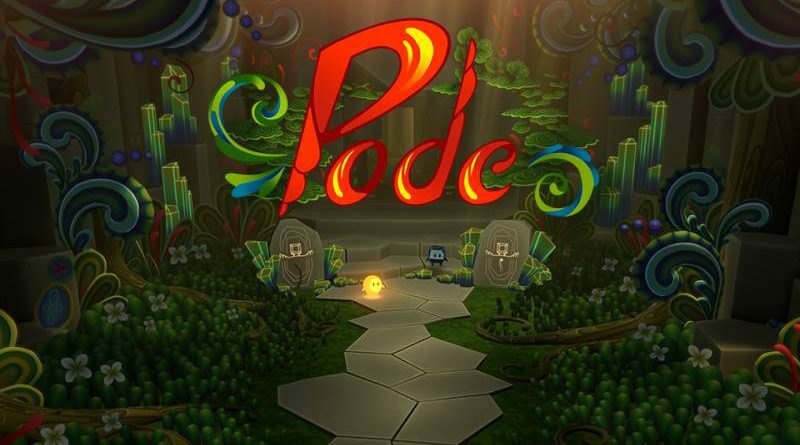 Pode’s main selling point is its co-op, with each player claiming a character, or on the fly swapping if a bit of platforming is a struggle for one player, you can enjoy the wonderful chilled ambience the game produces. On multiple occasions both my wife and I let out an audible ‘awwww’ at the sites and sounds, mainly when Glo was calling for Bulder to hurry up and come to the exit of an area. It’s worth pointing out the Pode can be played in single player but to be incredibly blunt that is not the thurst of the game and there is little fun to be had from it. Controlling both characters and swapping between them all the time is quite simply a tedious affair and really detracts from the joys of running around and for no reason at all spreading the plant life around or having Bulder build crystal displays with his powers whilst you’re trying to solve a particularly hard area. The visuals are going to be a little twee for some players, with its obviously cute stylings and mascot-esque main characters you could be forgiven for being cynical about its target. But trust me when I say that Pode is a beautiful game that is even better when marveled at with someone beside you on the sofa. Over the years its been easy to lean into the stereotype that non-gaming people see, especially on TV and Film, that games are just running and gunning affairs where if you’re not calling someone something offensive over a headset you’re not gaming; but much like settling down to a nice animal documentary it’s wonderful to have a game that we can all describe as chilled. On warm summer’s evenings my wife and I settled on the sofa and serenely moved through the game just feeling good about ourselves and the world. No screaming, no anger and no negativity. Even getting stuck is a fine experience with the decorating of areas with your element. Pode’s audio is suitably chilled with a jaw droppingly beautiful soundtrack that doesn’t even try to get you amped up but instead continues to lull you into the world and the atmosphere it generates. Developers Henchman and Goon have a clear vision for the game and have made no comprises in its design. Never pulling a fast one on the player but instead maintaining its eye on the goal of a relaxed pace. The game isn’t going to be for everyone, it does require some thought and is only really viable if someone is sat next to you but if you can get on the same wavelength as your partner and you are able to keep focus on the game you’re honestly in for a treat. The cliché of question of ‘what game is good for my non-gaming partner?’ can easily be answered by Pode, a satisfying and beautiful romp with a fairy tale story and adorable characters you wish you had plushes of on your bed.